Last edited by fierocious1; January 1st, 2017 at 03:02 AM. I don't have access to the royals. Have never seen the trucks on them. The ones I am working on are an inline conversion plate, NTS and will be with hourglass configuration in the cushion set. 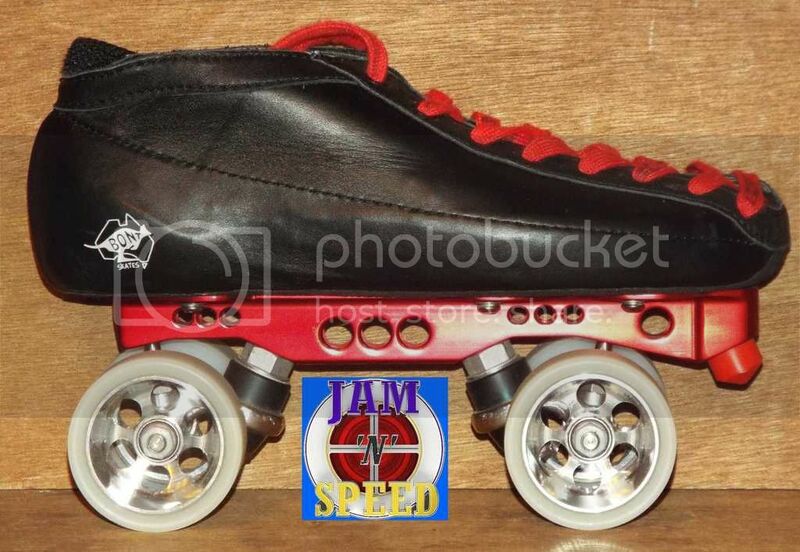 I skated some soft set up skates with stock type cushions setup not long ago and just hated it. Also these will allow some tuning changes in Caster. I will be making two prototypes, 165MM and 195MM. So testing will commence hopefully this weekend if I can get it all worked out. Several steps in the process. I have the last steps worked out. The first two I need to still get setup but it is less involved than the last one are. Going to test the strength of RED Locktite. Kingpins will not have locknuts but will not be pressed in either. I want to make sure the locktite will get it done. I would like to see a side shot pic of a bare royal truck. I could then tell you if it would work for what I am trying to accomplish. Are you going to try and make some magnesium plates too? Read my mind... LOL. If I like how they perform, yep. I'm fairly sure the SG Avenger was designed from the ground up to use the DA45 trucks that fit on many SG plates. The Avenger's predecessor was the Magnum which I believe was originally a SA. twas designed as a 45da. I have Yellow Magnums, White Magnums and Invaders. The trucks fit all of them the same. The SA 45 trucks just did not work for me. I did not like the handling with them. I then tried the DA45 conversion trucks out and have liked them a lot better. Ive used them on SSTs as well but there was a bit of shimming involved but the result was good with the trucks on SSTs as well. Caster changes can make or break handling. I now have another set of SA trucks to play with on the analyzer soon. But I want to set them up with the ability to make the caster changes as well. I believe that with a longer kingpins, and cushions below the SA trucks similar to what Armadillo had one set up, will work with the mods I'm planning on my plates. With the analyzer I won't even have to put them on the skate floor to see what can be accomplished. A lot of people don't realize that caster and cushion hardness go hand in hand and are totally separate issues. 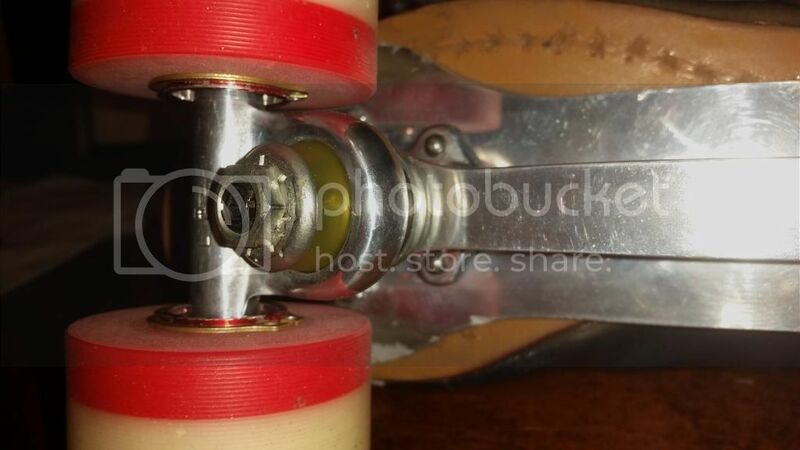 The reason people don't realize it is that nearly all skates are "fixed" in a way that caster is extremely limited. You have to modify the plates in some instances to be able to make changes in caster. The downside is longer kingpins and more weight in some cases, but the gain is great handling. Anything you add is weight, anything you take away limits handling. Very short cushions and cups limit turning and free steering. Longer cushions allow more freedom of compression of the cushions which in turn allows more turning without cushion binding. that way they will be lighter than air. only problem being youll have to tie em down when you take em off. On more serious note do you have a heat treating plant nearby ? I have known people to puchase a specific type of alloy and not get what they ordered and when it got hardness tested it came up soft. 1 pair of mini bike forklegs snapped hospitalising the customer because the manufacturer had trusted the supplier but was sent 1 wrong lot of alluminium by mistake..you probably have access to rockwell tester anyway so you can keep an eye on things. I always wanted to stamp out a pair of titanium plates and weld in the pivot and kingpin hangers. I would love to have a mill and a lathe at home.would come in handy. cant wait to see the inventions. I wished that these were bridgeports and better, but these will do. Found one mills in local trader papers and the other wasa new one that had parts stripped off it. Got it cheap. All the replacement parts were a little over $100. I traded for the lathe. Some small block chevy heads got it. Then it all sat in storage for several years. But occassionally i did get to make stuff on them. Having even manual tools helps. I dont even have DRO on any of these. Ill probably just use bar stock magnesium, mill them out just like aluminum. Agreed. The Royal trucks look really cool. But the riveted hangers do add weight. Lloyd, I've got a new set of Royals I'm about to mount. Let me know if you are able to skate Sunday, and I'll bring them. Vehicle troubles, won't make it Sunday. I would love to look at the Royals though. This week has been tough, but it is going to get better now. Sorry I got here late. But I gotta jump in. Actually, the Royal is nothing more than a light weight Imperial. Lot more machining.. but not much "designing". It uses the same trucks as the Imperial lite. So the Royal was originally designed to be an Imperial, then cobbed to be Royal, following your "logic". The Avenger was NEVER a single action plate. Not now, not ever, except in your head, which does not count!! But I imagine an Avenger could be converted to SA if one so desired. I have some scrap ones w/ stripped toe stop screws.... I'll put rubber pivot bushing in them and see if it will convert backwards.. Cannot imagine why it would not but also cannot understand why anyone would. Come to think of it, did one of our members not do that a while back?? Now, the second half of your statement is dead on.. Indeed, the "DA45 trucks that fit an SA45 plate" are exactly that, assuming the SA plate is accurately machined.. BTW they do the job quite well... So, where do you get off denigrating something that was specifically engineered by the manufacturer to accomplish a specific task and have that newly engineered part perform as intended a "cob job"?? The DA45 truck was intended to serve a specific purpose... Make something that behaves like a Snyder Imperial action on the cheap. It does that very well. There are no rivets on a DA45 truck of any flavor. You are referring to what the manufacturer of the parts in question calls hangers.. I believe I have explained this before, but I will gladly refresh your memory. See the diagram and note Key item # 1 "Main Plate with Hangers". 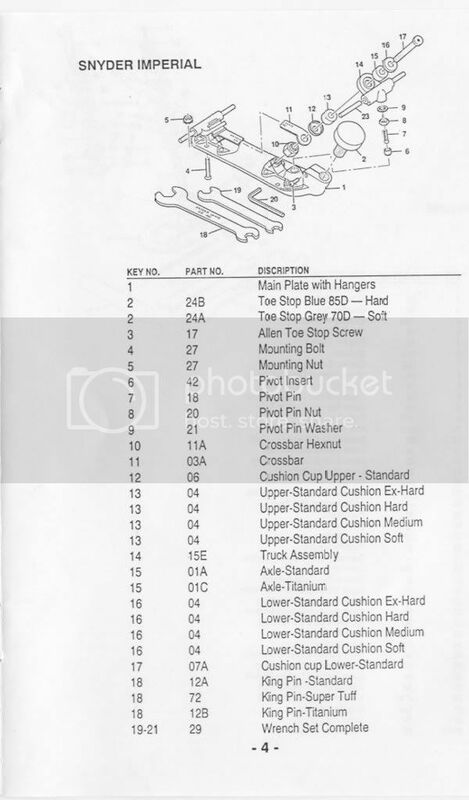 Also note Key item # 14, Truck assembly. There are absolutely NO RIVETS listed for #14. In fact, note that there are no rivets listed as parts @ all. Why?? If a hanger was broken or damaged, the plate was sent back for repair. The vast majority of rinks did not have and still do not have the equipment or technical expertise to set the Snyder rivets properly. For that matter, neither do I. If Jam'N'Speed gets a broken Snyder hanger for repair, Jam'N'Speed sends it back to Snyder. Please quit using the incorrect terminology when discussing anything Snyder related, if for no other reason than out of respect for the man that designed the original Snyder sk8s. 6.25" wheelbase. Got one in NTS too. Snyder Royal trucks..Oh wait.... I must apologize, this has a 25° king pin, not Snyder 30° king pin. (not to mention that "Johnny come lately" Bont boot) Why must I apologize? ?Well,according to your "logic", this plate must be a cob job. The geometry of this custom, hand milled plate is based on an Ultimate II action NOT the Snyder action. The pivot cup location was adjusted slightly to correctly accommodate the Snyder Royal truck.... So the plate was "redesigned" as you put it, to correctly accommodate the Royal truck and allow a full size toe stop. Stops do not fit on converted UIIs. BTW I prefer this geometry 25° over the Snyder 30° version. Just like I prefer the Avenger DA45 over any SA plate that ever was. Drop me a PM. I imagine I can loan ya a Royal truck. It's not Like i don't have a half dozen pair hanging in the shop. I have riveted Snyder hangers to 1/8" aluminum sheet. It's not hard to do if you have the correct equipment. The point I thought was being made: The billet design (like Snyder Advantage) will be lighter than the hanger design. I bet you do have a bunch hanging around! I really just need a broadside shot of the truck(axle end view), that way I can determine if I would want to pursue a new plate design. There are specific properties of the DA45 SG truck that allows for the changes I like. When the Royal trucks were mentioned I just thought I would take a look at it. But you know me, DA45s are my kinda stuff. Not that it matters...but let me again explain the difference between the Royal D/A45 truck (including the hanger) which is a true D/A45 truck and the trucks being mounted on the NEW, avengers, which are copied exactly from the original MAGNUM which is an S/A45 plate, which was cobbled into doing duty as a D/A45 plate.